Last week, the Brewers unveiled a new logo to commemorate their 40th anniversary. The logo blends old and new as a visual bridge from the team's inaugural season in Milwaukee to the present. It will be worn on the sleeve of the jerseys (I'm guessing the right sleeve, because the M logo with Wisconsin behind it is on the left) for the duration of the season. While the parts of the logo that correspond to the team's current identity package are fairly obvious (the M logo, number fonts, and colors), the past is shown by what's behind it. Yes, that is a nod to Barrelman, the logo and mascot of the Brewers from their inaugural Milwaukee season in 1970 to 1977. The one-sided shading of the barrel is also consistent with the original Barrelman, and gives the logo added variety and depth. The M logo and ribbon break the outline of the barrel for visual interest. The rarely-seen red makes an appearance on the ribbon for a splash of color. Overall, I would say the logo is well put together and consistent with the two identities the Brewers merged to create the mark. 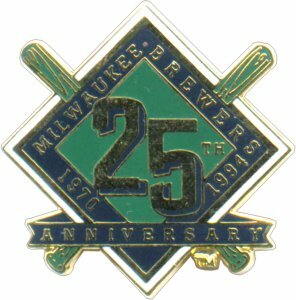 How does it compare with some of the other anniversary logos the Brewers have had? It's on-par with the "82 logo" the Brewers wore in 2007 to denote the 25th anniversary of their lone World Series appearance. Although I prefer the colors on the 82 logo, I understand the rationale for the 40th's color choices. When compared to the Miller Park Inaugural Season logo, the 40th wins hands-down. The Miller Park logo unnecessarily uses green and red together when either color would have worked. The barrel shape of the 40th logo is also far more pleasing than the over-elongated amalgamation of shapes the Miller Park logo utilizes. The Milwaukee and Wisconsin sesquicentennial logos don't really count, as they have nothing to do with sports outside of where they appeared. The 25th Anniversary logo is well done, but only represents one era in Brewers History, while the 40th logo shows two. The 20th Anniversary logo is a product of its time, before most teams understood the full value of well designed marketing. The Brewers have also decided to host four "Retro Weekends", the Fridays of which they will wear uniforms commemorating the four decades of Brewers History. The 1970s weekend is from May 14th-16th, in which the Crew will don the block M hats and 1970s uniforms. The 80s are back from June 25th-27th, and the Brewers will rock the ball-in-glove era look for the occasion. The 90s weekend will feature the German M cap and corresponding uniforms, from July 23rd-25th. And the 2000s weekend is from August 27th-29th and the team will wear their current uniforms for that weekend. 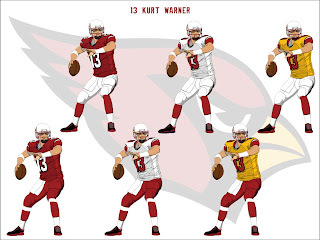 I will start the design portion of this entry with a losing team from the Divisional round of the NFL Playoffs, the Arizona Cardinals. The jerseys feature red sleeve inserts with white accents and black piping, as well as a yellow (white on the alternate jersey) insert on the collar to match the beak of the logo. The pants use sharp curves in a design that matches the look and feel of the sleeves. I have also included options for red pants and yellow alternate jerseys. Next, we have the New York Jets. I went back to the days of kelly green because I find the forest green outdated and dull. I also modernized the logo they used from 1978-1997. The green helmet features a wraparound design of the jet in the logo. I took the idea of contrasting sleeves that the team currently uses and applied it in a way that fits with the curves of the jet on the helmet. The number font was chosen for its futuristic look, and the wordmark is placed under the collar. The pants also feature a sleek design, in tune with the style of the other elements. Green pants have been added as an option. Finally, we have the Vikings. 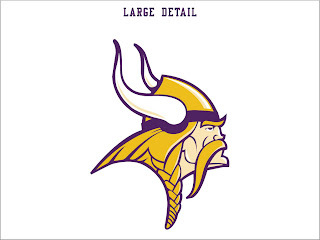 The current Vikings logo desperately needs an update. It's pretty obvious that it's a drawing from the 60s, not to mention the face is a little too pink for an NFL logo. I took the liberty of bringing the logo into the 21st century. While the current logo uses purple, gold, black, white, and that pinkish tone, my version only uses purple, gold, white, and a flesh tone that is a percentage of that base gold. This "percentage color" not only fits within the scheme better, but also saves on printing costs when the logo is printed on letterheads on other paper-based pieces. In addition, I have added highlights and shading to what was a rather flat logo. The helmet now shines and the horn looks rounder. For the uniforms, I updated the horn, so it does not feature black but utilizes a hint of the percentage color for depth. The uniforms are more of an update to rid the Vikings of the issue they have with the way the side panels of the jerseys awkwardly transition into the pants. Gone is this poorly thought out decision to have a white block interrupting the flow of the entire uniform. Now a simple yellow line of piping consistently flows from the jersey to the pants, no matter what combination they are wearing. Speaking of the pants, they now feature a swoosh that resembles the shape of their horn. I have also added options for purple pants and a "Minnesota Wheat" colored uniform as an alternate. 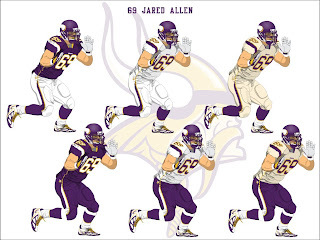 In case you were wondering, next time I will remember to include Jared Allen's mullet. That's it for this week. Next week, I will preview Super Bowl XLIV uniform-style. Feel free to sound off on the Brewers' new logo, the designs above, or that animal pelt glued to the back of Jared Allen's neck!